It looks like the full student experiment will have to go on hold for a week or so. This is because I’m moving on Saturday and I still have a freezer full of food to get through. Besides, my new surroundings in student halls will make the experiment feel all the more appropriate. In the mean time I thought I’d try out one of my ideas to give you taste of what is to come. I bring you my “students’ turkey and leek pie”. I was a bit too stingy with the pastry so it leaked at the sides little. Apart from that, it worked and was really very nice. The important question, of course, is “how much did it cost?” The breakdown goes like this (sorry about the bad formatting - I’ll sort it out later). That makes enough to serve two very hungry people or possibly three normal people. Almost 600g of meat went into that along with two leeks. 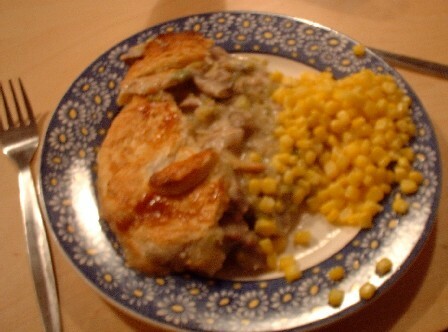 The pie would make a balanced meal in itself, but I served it with a side of sweetcorn. I estimate that this added about 5p per portion. Admittedly it isn’t much to look at but it was genuinely very nice and disturbingly healthy. So much for pasta with tomato sauce! 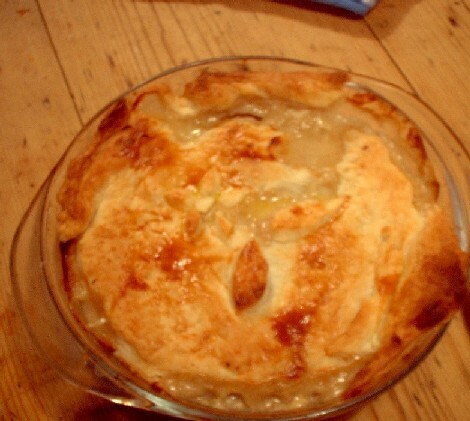 Here is the student turkey and leek pie recipe. Remember those fresh greens I was talking about a couple of weeks ago? I had a feeling they might make good crispy seaweed. I was right! I made seaweed once before using recipe from a chinese cookery book. It suggested using the green bits of pak choi leaves. The result was good but, since you can’t really use the white fleshy bits of the leaves, you have to use a lot of pak choi. This makes the seaweed a bit expensive. The fresh greens were much better in this respect. They are quite big and the leaf stalks are small. 1 fresh green will make enough seaweed to accompany two meals. Don’t use the yellow bits! They don’t look very good. I had my seaweed as an accompaniment to a beef fillet I picked up on the way home. I intended to have it in a Thai dish. In the end, after finding some peanut butter my housemate was struggling to get through, I made an Indonesian-style peanut sauce for it. I cut the steak it into thin strips, marinated them in soy and spices and flash fried them for just a few seconds. 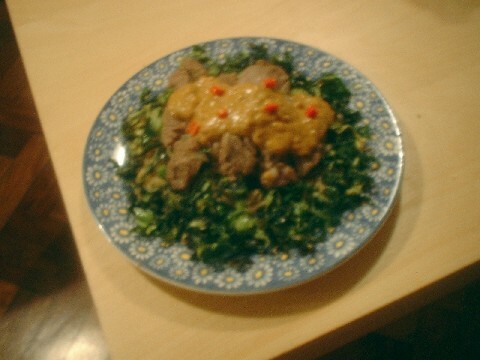 I served the beef and seaweed with some noodles and the peanut sauce. The crispy seaweed recipe is here and the beef with peanut sauce recipe is here. Well, maybe it wasn’t exactly a Wellington, but it was wrapped in pastry. Another day, another new meat to try. This time it is the South African antelope, kudu, which is steadily growing in popularity amongst game eaters in Britain. I’ve been inspired by this page at the BBC and, reading that rose flavours work well with game, I thought I’d try it out on my kudu steaks. There is an Iranian (I think) shop on my way to college and I found a selection of rose condiments there. I got some rose petal jam to make a paste to smother on the steaks. I mixed the jam with some lemon juice and zest, wrapped the entire thing in a rosemary and thyme crepe, covered it in puff pastry and baked it. It nearly worked very well. The problem was, the pastry wouldn’t rise! Icouldn’t understand it. Usually gas mark 7 for 15 minutes will suffice. This time it didn’t show signs of puffing for about 25 minutes. After 40 mintes it was ready. This was all fine apart from the fact the kudu was now well done. I wanted it rare. I was annoyed. Apart from that it was great. Kudu is very tender and juicy. I had it with lemon and coriander cous-cous. I had a bit of rose petal jam left so I made a sauce by mixing it with some white wine, cinnamon and half a capful of cherry brandy, just to give it extra richness. It seems that cherries+roses+game=tasty. It’s definitely one to try with venison and pigeon. So, for those of you who like your meat well done, this is a good way to do kudu. Full details are here. Next time I’m making my own pastry.